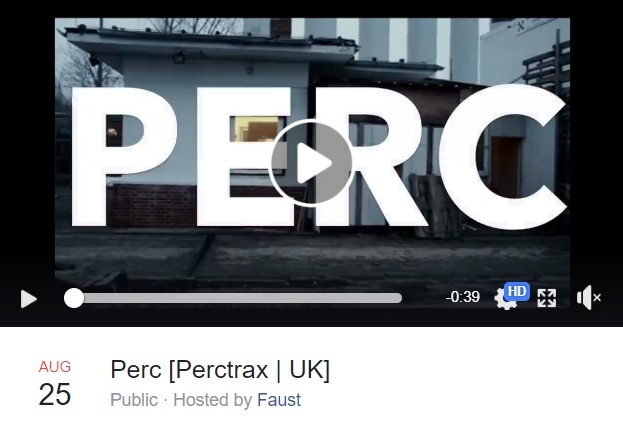 I had to smile at the serendipity of it all when I saw that Perc was booked to play at Faust this past Saturday. As chance would have it I’d been rinsing the London-based producer’s three albums (Wicker and Steel, The Power and The Glory, and Bitter Music) pretty heavily for the past month or so, so it seemed like a stroke of exceptional good fortune to get the chance to see him in the flesh. Perc, or Ali Wells as his mum knows him, is a true giant of contemporary techno. He’s made a name for himself not only as a producer (having released tracks on seminal labels such as Drumcode, CLR and Stroboscopic Artefacts) and as a DJ, but also as a label owner in his own right; his Perc Trax imprint is one of the few labels which I make sure to listen to every single release off of, and he’s been responsible for bringing global attention to fantastic techno artists such as Forward Strategy Group, AnD, Ansome, and Truss. Perc’s production – and to a lesser extent the music he shills on his label – favours techno of a dour and dystopian bent, textured, abrasive tracks that invoke slate grey English skies, drab council estates, and factory chimneys belching out black smoke. He’s part of a vanguard of British producers – including artists such as Surgeon and Shifted – proving that heads-down pounding techno is not just the reserve of Berlin, and that the UK is still a crucial component in the international techno machine. As excited as I was to see Perc DJ, I foolishly ended up missing the first bit of his set – took a nap before I went out, but managed to sleep through my alarm. I got dressed and rushed out as fast as humanly possible once I realised what had happened, but it was past 2 am by the time I got to Faust (Perc started around 1:30), which also meant that I had to pay 30 000 won to get in rather than the 20 000 I’m accustomed to paying. An irritating start to what would fortunately prove to be an amazing night. The first thing I saw when I walked into Tanzbar was a middle-aged Korean man in blue work overalls and a cowboy hat, grooving to the music with an ecstatic grin plastered over his face. He seemed to sum up the eclectic nature of the crowd in Faust that night, which consisted of everyone from slick hip hop kids in designer tracksuits and bucket hats, to moody neo-goths with facial piercings and black lipstick, to a bunch of guys who looked like they’d just gotten off from work at some chaebol, still decked out in stiff white collar shirts and dress pants. I enjoyed the variety of it all – seeing people seemingly drawn from all kinds of sub-cultures and social scenes, rather than the usual monotonously dressed techno hipsters I’m used to seeing elsewhere (though that being said, I will always have a soft spot for those same techno hipsters, of course). It’s also a good indicator of the health of the scene – the diversity of styles on display implies that there’s a diversity of people being drawn to this kind of music. I didn’t stay long in Tanzbar, downing my free drink as quickly as possible and then rushing into Faust so that I didn’t miss any more of Perc’s set than I already had. Stepping onto the dancefloor was like walking into a warzone; Perc was busy battering the crowd with a barrage of hard, no-frills percussive techno, every distorted hat or snare or clap hitting with the force of a high-calibre bullet. It was definitely the hardest set I’ve heard all year, and very possibly the hardest set I’ve heard in my entire life. I don’t know if the BPM ever dropped below 130, and the raw and aggressive nature of the sounds flowing out through the speakers felt closer in spirit to industrial metal or thrash punk than it did to most dance music, even though the standard 4/4 kick pattern was present throughout the majority of it. Dark and angry as his tunes were, however, the impact of that darkness was more exhilarating than it was oppressive, inspiring the people around me to cut lose and dance with a lack of restraint relatively unusual in Seoul. That lack of restraint worked against me at a certain point, when the guy I was dancing next to got a little too creative with the shapes he was throwing and elbowed me hard in the jaw, actually managing to knock me to the ground. He apologised, though, and though my jaw was still aching the next day it’s nothing worse than I’ve experienced in the average moshpit back in my (questionable) metalhead days. I found myself thinking that in some ways, Perc’s set felt like the polar opposite of Mike Parker’s set at Faust a couple weekends before. Parker’s deep, hypnotic techno had me in a kind of trance, the music sinking into my subconscious so that in a way I wasn’t even aware of what I was listening to – all I could do was keep dancing. Perc’s selections, by contrast, were up-front and in your face, coming at the audience like a sonic assault by invaders from Planet Rave. His transitions were smooth, obviously, but they were smooth in the same way that a car crash is smooth – one track would become another in the blink of an eye, and for those few seconds the space in between them felt full to the brim with noise and violence. It was terribly good, but also terribly intense; the pace was unrelenting, and I found myself tiring out quickly (something a lot of other people I spoke to that night were complaining about). Fortunately, whenever my energy flagged or the brutality of Perc’s tracks got a bit too overwhelming I could pop into Tanzbar for a sit and a drink, and zone out to the music of Nicolas Lian, who was playing a comparatively more mellow and soothing (though still suitable for peak time) selection of progressive techno, transcendental electro and blissed-out tech-house. A particular highlight for me was when he played Gui Boratto’s ‘Azzurra’, a track I haven’t listened to in years and that I have some beautiful memories associated with. I was very impressed by the range Nicolas Lian clearly enjoys as a DJ – his set in Tanzbar was worlds apart from the banging late-night acid techno he played when he closed for Mike Parker. I really enjoyed the contrast between his set and Perc’s, and I think without the presence of Tanzbar as a space to chill out in and briefly escape the brutality of Perc’s set for a while the night would have been a lot tougher to get through in one piece. I needed that little bit of rest and recuperation in Tanzbar, because in the final half an hour of his set Perc pushed the floor to absolute breaking point. The last few tracks he played sounded as if someone had synced an exploding train station to a 909, and each transition between tunes was marked by a cacophonous gale of static and raw noise, accompanied by a flood of white light from the strobes (at this point it must be said that as usual, Faust’s lighting game was on point – they made really excellent use of strobes, floodlights, lasers, fog and all the other usual atmospheric club tricks). At that point, it was easy to forget I was in a nightclub in Itaewon, South Korea; through the power of music Perc had transported the entire crowd through space and time to what felt like a warehouse rave somewhere in the grim north of England circa 1996 (or possibly 2096) – as if Perc was a Time Lord and the DJ booth a TARDIS. By the time he played his final track I never wanted him to step away from the decks, regardless of how much my legs and feet hurt from dancing. Unfortunately, the closing DJ (Suman)’s set was a bit of an anticlimax. I get that it’s hard to follow someone like Perc, who’s probably one of the best techno Djs on the planet right now, but Suman’s set fell completely flat to me – generic rolling dark techno with little about it to stick in the memory or get the body moving. It was really a let-down, as I was incredibly pumped and excited after Perc’s set and looking forward to dancing more, but there was just nothing about the set that moved me. I gave him half an hour hoping it would pick up, but it never did, so I ended up going home, a little disappointed. This is a recurring problem I have with Faust, actually. They typically book amazing international acts, but their actual residents frequently (not always, but frequently) fail to measure up to the guests, and the sense of continuous flow and musical narrative between the opening, headlining and closing act is often disrupted or just totally absent (which I’ve found is not the case at, say, vurt. or Volnost). Maybe that’s a little harsh – I’ve heard plenty of solid-to-good supporting acts at Faust- but the truth is that I’ll seldom go out of my way to arrive early to catch an opening act or stay late to catch a closing act at Faust, like I do with other techno venues in Seoul. That being said, I’ll forever be grateful to Faust for managing to lure so many world-class acts to Seoul, and I still think that Faust (especially in it’s latest incarnation) ranks as one of the best club experiences available in Korea. And as for Perc, well, Ali Wells brought the goods in a big way – but then I never doubted for a second he would.